Will be amended to fall in line with the Constitution’s anti-discrimination vision by recognising that military personnel are no longer men only but also women, that their spouses may be male or female, and that they may be married or partnered under different legal regimes. This is long overdue and critical as it has often resulted in delays when processing pension and beneficiary payments to deceased military personnel’s spouses and partners and thus their children as well. Will be amended to speed up GEPF divorce settlement processes when members of the GEPF divorce and then need to separate their assets (e.g. GEPF) with their now ex-spouses and partners. This is important as divorces by their nature are acrimonious and the newly separated ex-partners need to quickly separate and build new lives e.g. set up new homes, purchase furniture etc. Delays in settling the separation of pensions and assets hurt in particular mothers and children. Will be amended to provide for surety of assets and credit for investors. This is part of South Africa’s obligations arising from its membership of the G20 and a key requirement for international banks and investors to remain and to continue to invest in South Africa. Workers, battered by a 37% unemployment rate and rising levels of retrenchments, need investments, both local and international, as part of ensuring the implementation of the Presidential Jobs’ Summit’s Job Creation Plans. Will be amended to allow State-Owned Enterprises to apply for banking licenses. 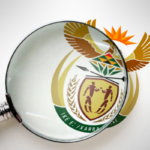 SOEs will be required to be in a healthy financial state when applying for banking licenses and in particular for their assets to exceed their liabilities for the previous 2 years, as well as to have the authorisation of both their line function Minister and the Finance Minister. SOE owned banks will be subject to the same licensing requirements and oversight as all other banks. COSATU supports the expansion of state banks as it will help end the de facto monopolies in the banking sector, ensure greater competition, lower bank charges; and bring greater accessibility to the marginalised and poor as well as neglected sectors of the economy. COSATU submitted additional amendments to further strengthen the checks and balances and oversight for SOEs applying for bank licenses. These are critical to protecting the fiscus and workers from possible looting as it will be taxpayers and workers who will pay the price if any SOE bank requires a bailout in future. As the NCOP has now concluded its work today and thus there was not sufficient time to amend the FMA Bill, the NCOP has agreed to COSATU’s request to refer its proposed amendments to the 6th Parliament for consideration. SABC News reports that President Cyril Ramaphosa says South Africa is facing a national crisis as cases of gender-based violence and femicide escalate. He was speaking at the opening of the Sexual Offences Court at the Booysen Magistrate’s Court in Johannesburg. 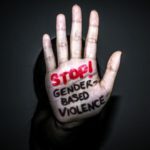 President Ramaphosa also signed a declaration emanating from the 2018 Presidential Summit on Gender Based Violence where women raised concerns over the high prevalence of abuse against women. The state-of-the-art court cost over R240 million to construct. Ramaphosa says despite the best laws in the country, women are still being abused. The court offers a range of services & is fully equipped to support victims of gender-based violence & femicide. 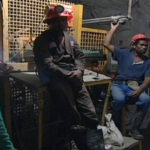 The National Union of Mineworkers (NUM) is shocked and highly disappointed that another mineworker has lost his life yesterday at Modikwa Platinum Mine in the North East region on what is reported to be a fall of ground. “The NUM is saying one death is too many and we call on the Department of Mineral Resources (DMR) to start implementing the Mine Health and Safety Act to its fullest. It is high time that the department starts with a process to amend the Mine Health and Safety Act no. 29 of 1996 section 86A 45, in that those who are legally appointed by section 4.1 and section 3.1 of the Act should be held responsible for any death that happens within their area of responsibility and we further call for a harsher sentencing of such perpetrators if found guilty of any wrongdoing and we appeal to the lawmakers to propose a long sentencing and heavy penalty to any Mine that kills a person,” said Phillip Mankge, NUM North East Regional Secretary. The NUM strongly believes that drastic action is needed to compel the mining industry to comply with safety standards and procedures. The NUM remains of the view that the state must undertake a technical audit into the mining industry to amongst others do an audit of the aging and ailing infrastructure that continue to fail hundreds of miners and leaving thousands of people as orphans. We call on the state to hold the industry fully accountable for its failures and adopt a no-nonsense approach when it comes to mine deaths. 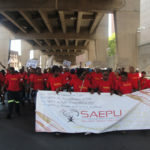 The South African Emergency Personnel’s Union (SAEPU) will go ahead with its planned picket on Friday at the Health Professions Council of South Africa in Gauteng, Pretoria. – Reducing the default penalty. eNCA reports that the South African National Roads Agency will no longer be pursuing criminal action against e-toll defaulters. This follows a resolution by the board of the roads agency and will not act against historic debt, or on summonses from 2015. Sanral says it will not apply for any new summonses. 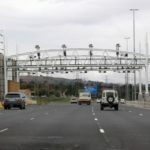 The move follows endless campaigns against and calls for the scrapping of the e-tolling project. Business Live reports that the department of trade and industry’s reckless pursuit of the Copyright Amendment Bill will have disastrous consequences for SA creative industries. Due to the unspecified “fair use” clauses in the current bill, artists will have no protection from rampant plagiarism, which favours those who seek to exploit original content without creating it or investing in it. At face value, amendments to the bill imply “fair use” of work in the pursuit of education or dissemination of information. However, the bill goes too far and will ultimately work against SA content producers. In the publishing industry alone, PwC’s economic impact assessment projects a 30% reduction of sales and a loss of jobs equating to R2.1bn per annum. “Fair use” would allow for the unspecified use of others’ work without permission. An operational example is the American Psychological Association, which allows permissible citations of a substantial 400 words in single-text extracts, or 800 words in a series of text extracts. This problematically impinges on copyright, especially as it is moved to different platforms, for example online open-access platforms. The unclear line between this and plagiarism at tertiary level is incredibly hazardous to SA educational standing. Professor Keyan Tomaselli, of the department of communication studies at the University of Johannesburg, warns that without protected in-house publications or course literature, private educational colleges will decline. He also stressed the necessity of competition to diversify and advance the quality of local education. 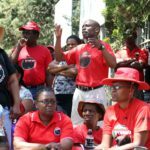 The National Education, Health and Allied Workers’ Union [NEHAWU] will today at midday brief the media on the upcoming strike at the South African Revenue Services [SARS]. Yesterday evening a meeting was held with the employer to try and find common ground but negotiations once again deadlocked. In this regard, the national union is continuing with the strike and it will commence on Thursday, March 28, 2019. NEHAWU will brief the media and the public on the state of readiness and details of the strike. 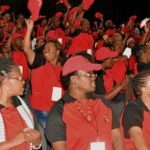 The National Education, Health and Allied Workers’ Union [NEHAWU] is forging ahead with its upcoming strike at the South African Revenue Services [SARS]. The strike is scheduled to start on Thursday, March 28, 2019. The strike is as a result of a deadlock in the wage negotiations that has been ongoing for the past five months. The national union declared a dispute after it was clear that the employer was hell-bent on giving workers a salary increase below CPI or a real salary increase. 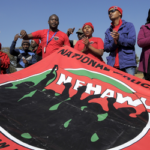 NEHAWU then served the employer with a notice to strike on the 20th March 2019 after receiving a certificate to strike. The union then convened a national bargaining forum meeting on 26th March 2019 which was attended by Full Time Shop Stewards [FTSS], Provincial Coordinators, Provincial Organisers and National Office Bearers. The meeting received reports from the negotiating team on the process from the National Bargaining Forum of SARS to the point where the matter was referred to the CCMA. After extensive deliberations, the meeting took a decision to forge ahead with the strike as planned. – A single term; Salary Increment of 11,4%; SARS must compensate employees for recognised improved qualifications in the form of a 1% increase as well as a 10% bonus; Long Service Awards; Performance Bonus policy; Family Responsibility Leave (FRL) we demand the introduction of a 3-year cycle; Pre-natal and Vaccination leave 8 working days / 16 half-days for vaccinations and pre-natal check-ups. Lastly the union is demanding that all the benefits that the employer withdrew during the negotiations in December 2018 must all be reinstated. 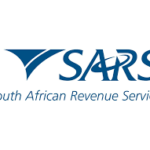 EWN reports that the South African Revenue Services (Sars) says talks will resume with trade unions this week to find solutions before any planned strike by workers takes place. The planned industrial action is scheduled to kick in on Thursday. Employees have issued the agency with a notice to strike in the next seven days should proposed salary hikes and other demands not be met. The Citizen reports that about 175 workers have gone on strike at RCL Foods’ business unit Millbake over a wage dispute, forcing the consumer goods company to obtain an urgent court interdict to stop the go-slow. Millbake is RCL’s largest milling and bread, flour and maize meal producer in the country. According to the company’s Stephen Heath, the dispute has been going on for some time now and it had reached a deadlock with workers downing tools over management’s refusal to increase basic salaries to R9 000 and to R15 000 for those earning above R9 000 per month. Heath added that the demand from the union was for an average salary increase of 112% which he said was neither reasonable nor possible. According to the workers’ memorandum of demands sent to the company, the union argues that their demands were based on the rising cost of living, economic conditions and the impact this has on the disposable income of workers.